While much of the attention has turned to Florida and the massive Hurricane Irma, recovery in Texas after Hurricane Harvey will take months and in some cases even years. For now, automakers and their dealers are offering substantial discounts on new cars in parts of Texas affected by the storm. Local dealerships are handling the “abnormal” traffic consumers are bringing to stores as residents look to replace their vehicles, says Steven Wolf, chairman of the Houston Automotive Dealers Association. Wolf, who is also vice president of Helfman Motors, says he expects sales at his five stores this month to outpace the year-earlier period by 40 to 50 percent because of the post-Harvey rebound. Helfman stores sell Fiat Chrysler Automobiles and Ford Motor Co. vehicles. Sales activity, he said, went from one extreme to the other in a matter of days. When Helfman staffers returned to work Aug. 30 — the Wednesday after the storm made landfall the previous weekend — there was little activity. The next day, Wolf said, it felt like the “ice was thawing” as traffic began to trickle in. Then things went bonkers on the Friday ahead of Labor Day, Wolf said. The momentum hasn’t slowed since. Considering Houston’s sheer size — the metro area is about the size of New Jersey — the sudden sales blast isn’t too surprising. Wolf said people need to get around, so getting back into a vehicle is one of the first orders of business. “People have moved past the ‘Oh, my God, what am I going to do?’ [stage] to ‘Let’s get a plan; we need to do this, this and this.’ At the top of the list, it is, ‘Let’s get a replacement vehicle,’” Wolf told Automotive News. Many dealerships in the region managed to move inventory to safer spaces ahead of the storm, the publication reports. But that inventory is now increasingly pinched as people in places like Houston, Beaumont, the Gulf Coast and other areas rush to get new cars. 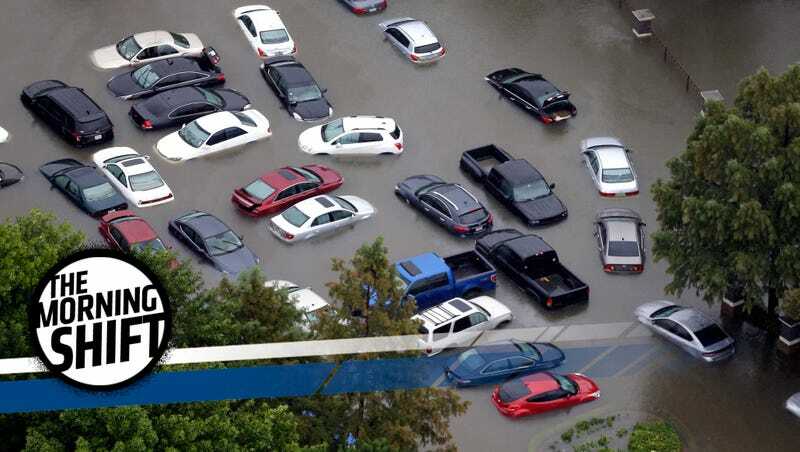 Eduardo Solis, president of the Mexican Automotive Industry Association, put imports of damaged vehicles after Hurricane Katrina in the thousands or tens of thousands. The auto industry has long complained that shady importers allegedly use bribes to go around regulations that prevent the import of damaged or stolen cars from the U.S. The problem has been tough to contain since Mexico unilaterally opened its market to used cars from the U.S. more than a decade ago. At the time, it was politically popular to have an ample supply of cheap, older autos from north of the border. Over time, however, the measure contributed to a sharp drop in new-car sales since it distorted the used market, pushing down residual values and making it difficult for owners of locally purchased vehicles to trade up to a new car. Industry officials complained that the imported cars weren’t being inspected for their roadworthiness or the validity of their titles. In a statement, Hyundai Motor said it would suspend operation of its Alabama plant for two days between 2:45 p.m. on Monday and 2:45 p.m. on Wednesday, while Kia Motors will stop operation of its Georgia plant for one day, from 6:45 a.m. on Monday to 6:45 a.m. on Tuesday. The shutdown comes at a time Hyundai’s U.S. sales have fallen more than the market average, and after it recently announced plans to expand its crossover lineup and launch a pickup in the market in an attempt to reverse the slide. The suspension is expected to result in lost production of about 3,000 vehicles, the Yonhap news agency earlier said on Monday, citing a company spokesman. Auto shows all over the world are under pressure as carmakers use social media and private events to introduce vehicles. But the situation is particularly dire in Europe, which appears to be retreating from the center of the global auto industry as China and the U.S. offer greater profits and more sales. IHS predicts European car sales will peak next year before settling in around 15.4 million a year. German automakers remain committed to their home auto show, though. Audi, BMW, Mercedes and Volkswagen will tout plenty of new vehicles and tech. What can we expect from the show? Electric concepts and big SUVs. China is also leading the electric push in a big way. It’s the world’s largest market for electric cars as Beijing seeks to mitigate the country’s massive air pollution problems. Here’s what the future looks like. Neutral: Did You Buy A New Car After The Hurricane?